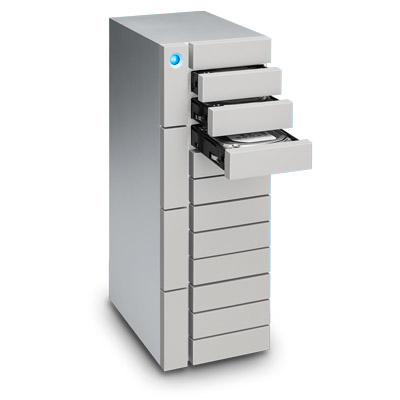 The LaCie 12big Thunderbolt 3 is a desktop storage solution with a capacity of 48 TB. The 12big achieves writing speeds of 2600 MB/s and read ratesof 1700 MB/s (in RAID 0). The LaCie 12big has two Thunderbolt 3 connections and a USB 3.1 port. The 3.1 port is backwards compatible with USB 3.0 and USB 2.0 via USB-C to USB adapter cable. The LaCie 12big is delivered with 12 internal Seagate® IronWolf Pro™ disks of 48 TB total. The LaCie can be used with Windows 8 or higher and Mac OS® X 10.10 or higher. RAW images from a Blackmagic® Cinema Camera can be quickly imported to Adobe® Premiere® Pro. Then edit multiple streams of ProRes 422 (HQ), ProRes 4444 XQ, as well as uncompressed HD 10-bit and 12-bit video. For big projects packed with high-def clips, thumbnail and preview rendering becomes much more responsive. With the large bandwidth, the Thunderbolt 3 lets you daisy chain dual 4K displays or a single 5K display to the LaCie 12big or 6big. With two 4K displays, you can spread out your workspace by dedicating one display to your timeline and the other to previewing 4K footage, for example. It's even possible to power a compatible laptop through the Thunderbolt 3 connection.